In the section on the derived functors of the inverse limit(with $...3\rightarrow 2 \rightarrow 1 \rightarrow 0$ as index category), Weibel constructs the inverse limit using the map $\Delta$ in the photograph. Later, he remarks that everything goes through for any $AB4*$ category. But I can't even construct the map in the general case. My question is, how does one do this for any $AB4*$ category? Browse other questions tagged homological-algebra abelian-categories or ask your own question. A quasi-isomorphism between the total complex of a Cartan-Eilenberg resolution and the complex per se. Is a kernel in a full additive subcategory also a kernel in the ambient abelian category? Are there right-deformations for abelian sheaves? 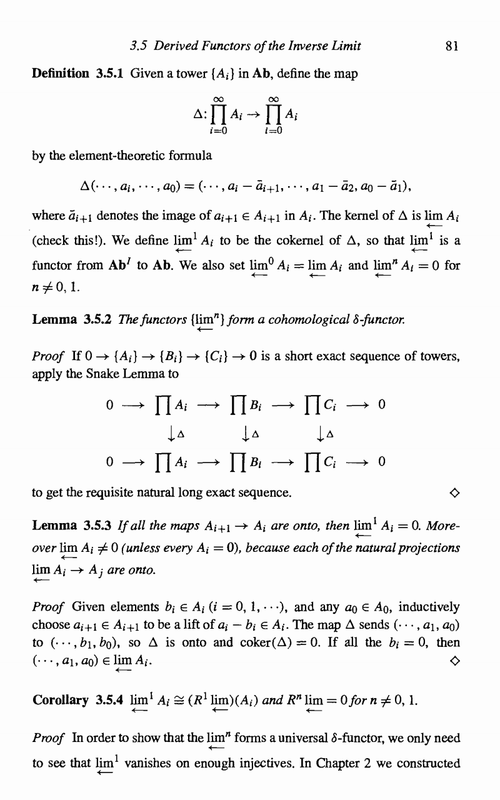 Vanishing of $\varprojlim^1$ on Mittag-Leffler sequences story. Exercise 4.4.1 in Weibel's 'An Introduction to Homological Algebra'.